The exceptional location of the Hotel Restaurant le Meysset will quite naturally incite calm. Our personalised service will reinforce this feeling of quietness. The heated swimming pool, solarium with breathtaking view overlooking two valleys will bring the relaxation necessary after a beautiful, big day out in Black Périgord. And what would you think of a relaxing massage to completely erase all trace of fatigue? To be in perfect communion with this gentle natural setting, in the midst of our parkland of 1.5 hectares you will find here and there stone benches where you can bask or pause to read. 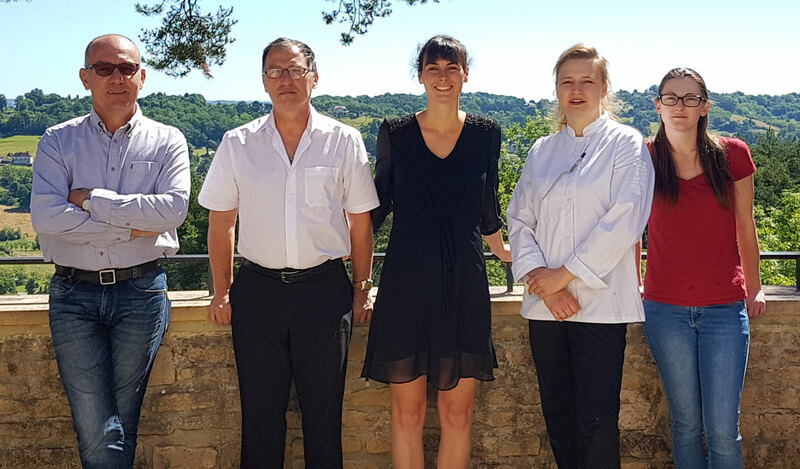 Of course, there is a service « bar » throughout the day whether it is in our main room next to the stone fireplace or on the terrace with its panoramic view over Sarlat la Caneda and the surrounding area. Hôtel Restaurant Le Meysset : Toute une équipe à votre service !